Congratulations on your engagement! We know you’ve fantasized about where you’ll tie the knot and we’re here to tell you that New York State has the venue for you. With New York’s diverse landscapes you’ll find everything from wild forests to gleaming lakes to sprawling meadows. Declare your love from inside a beautifully lit rustic barn, in the great ballroom of a historic mansion, or on the patio of a seaside hotel. 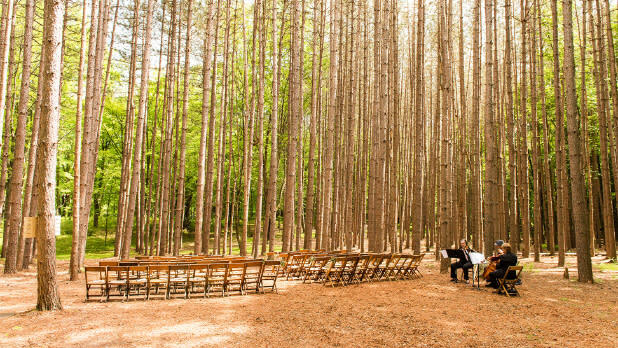 Whichever vibe fits you and your boo, find it in one of these 12 unique wedding venues. Have your cake and eat it too! Less than two hours from NYC between the charming Hudson Valley towns of Beacon and New Paltz, Nostrano Vineyards couldn’t be more picturesque. Their 75 acres of farms and vineyards include apple orchards and rows of grapevines and even a pond surrounded by green hills. 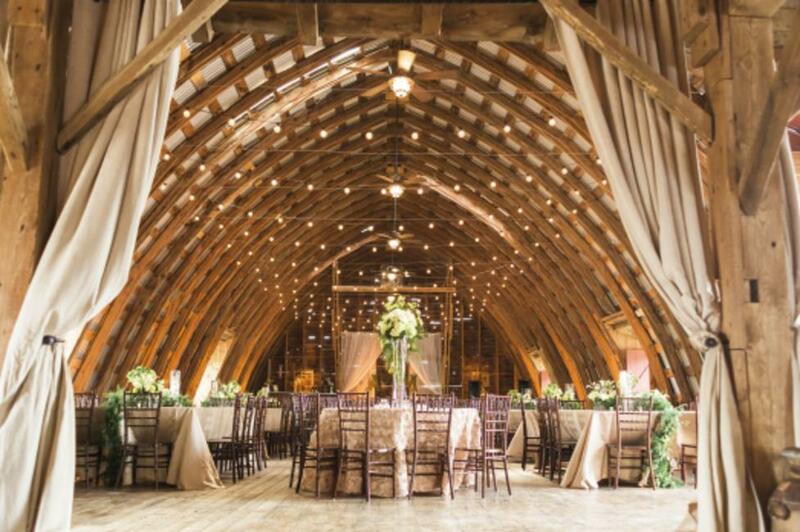 Hold your reception in the restored Pole Barn or rent a tent if your party is larger than 150 guests. Nostrano Vineyards hosts one wedding per weekend so you truly have the space to yourselves. Treat yourself and your close family and friends to a stay nearby at the luxurious Buttermilk Falls Inn & Spa in Milton, where you can prep and pamper yourself before or after the big day. Choose between rooms in the Main House, private cottages, and guest houses. Got your heart set on a rustic barn wedding? 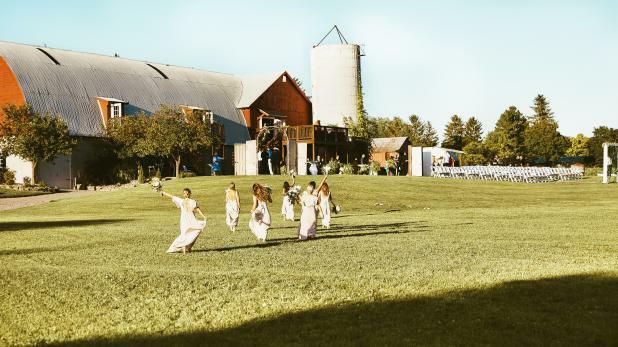 The Historic Barns of Nipmoose offer three gorgeous and picturesque barns, all of which will be dedicated to your special day—the owners only schedule one wedding per weekend. This means you’re free to hold the ceremony in one barn, the reception in another, and place a photo booth, seating cards, or refreshments in the third. 123 acres of farmland, woods, and a stream make the perfect backdrop for photos, and are visible from inside and outside the barns. The barns don’t have their own lodging, but their website has a lengthy list of nearby options in Saratoga Springs, Albany, Troy, and more, so your guests can find the most convenient option. Picture this: your guests sit in elegant wooden chairs on an expansive grassy lawn, gazing upon you and your beloved as you say, “I do,” tree-covered Catskill mountains rising up behind you. The Stonewall Estate’s 1850 farmhouse has been renovated and expanded to include a five-bedroom home for your family and guests. 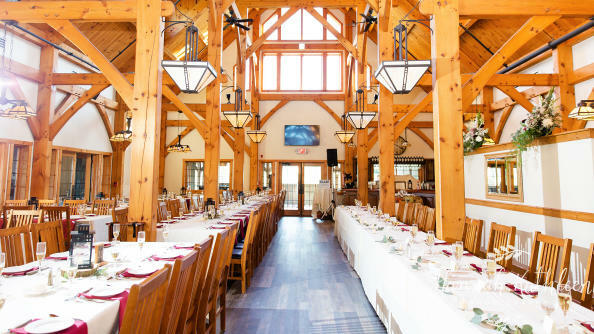 The barn where you’ll host the reception is simply breathtaking, with unbelievably high ceilings and wood scaffolding studded with string lights and chandeliers. Take your photos anywhere on the 30 acres of land, which include fire pits, patios, and a pond. Plus, you can treat your guests (or just get them out of your hair) by sending them to the 18-hole golf course two miles away. A wedding at the Roxbury Barn & Estate has a rare ethereal quality thanks to its location tucked in the forest. Your ceremony will feel both earthy but also elegant and stylish. From the Hilltop Pavilion you can see the mountains and surrounding woods. Pose alongside the brook, or the water lily pond, or in the outdoor courtyard by the barn. You and your guests will delight in the personalized farm-to-table seasonal menus and bar options from local craft breweries and distilleries. 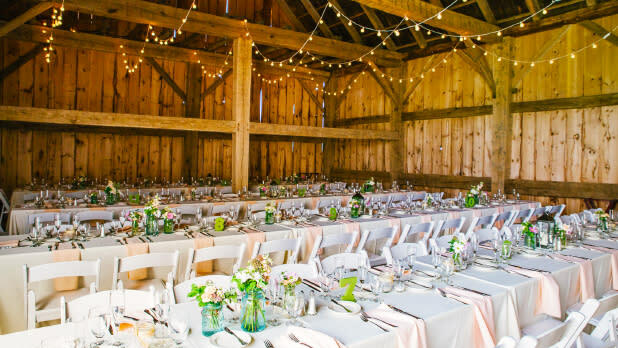 Hold your reception outdoors or in the renovated two-level carriage barn with a chic and cozy interior. Your guests can easily post up at the nearby Roxbury Motel, a fun contemporary lodging with playful decor. Have your wedding come up roses in this very special venue. That’s right—you can seal the deal in the beautiful blooming Buffalo and Erie County Botanical Gardens. Choose the outdoor Peace Garden and gazebo for your ceremony, or the indoor gardens, which are an excellent option year round but make a nice escape in colder months. You and your guests will be provided access to all available greenhouses and outdoor gardens so just imagine the photo ops! Buffalo is filled with gorgeous hotels to house everyone, not to mention the gardens are a 40-minute drive from Niagara Falls. You don’t win the WeddingWire Couples’ Choice Awards five years in a row and The Knot’s 2019 pick for Best of Weddings for nothing! Wow your guests with picture-perfect views of Lake George and receive exceptional service at the Inn at Erlowest. 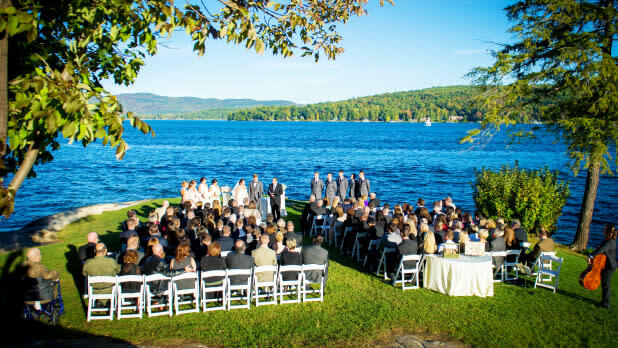 Have your ceremony in the courtyard, the Front Terrace, or even on the lake shores. Then, move into the majestic Grand Ballroom for the reception. The Queen Anne-style stone castle was once the home of millionaire Edward Morse Shepard in the 1890s and has been restored and polished to provide a sensational setting. Family and special guests can stay in the ten beautiful guest rooms and enjoy their own king-size beds, fireplaces, jacuzzi tubs, and complimentary farm-fresh breakfast in the morning. Husband and wife Mike and Alisha Mathalia dreamed of creating the perfect romantic setting for fellow lovebirds. So they poured their hearts and souls into renovating and beautifying the property that is now the Hayloft on the Arch. Today, Alisha works with you to plan every detail to your taste and coordinates the day of so you don’t have to lift a finger. 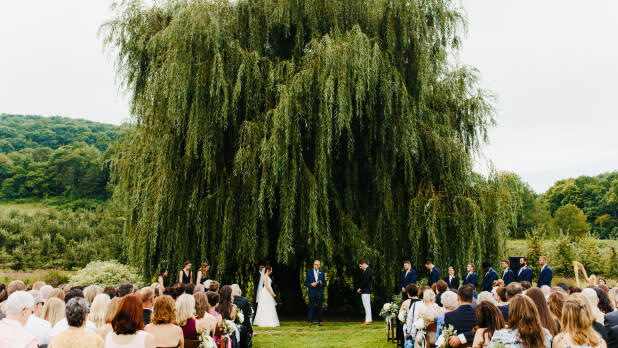 Your special day will take place on 8.8 acres of rolling hills, with a view of the countryside, and even a weeping willow tree next to a stream. One peek at the “arches” inside the barn (pictured at the top of this post) and you’ll fall in love. Indoors is an eye-popping space with high arched wooden beams, hanging lights, and soft design accents like paper lamps and curtains. It’s positively dreamy. Another 2019 pick for The Knot’s Best of Weddings, the Piermont is the full package. The venue is large enough for wedding parties of more than 300 guests, offers fantastic ocean views of Great South Bay, and provides a level of luxury that isn’t outrageously expensive. There are a number of locations you can choose for the ceremony. However, weather permitting, outdoors by the water is too picturesque for words, especially at sunset. The culinary team cooks up delights to write home about, made with local and seasonal ingredients and served with impeccable presentation. Just 20 minutes away are the Courtyard Islip and Courtyard by Marriott Republic Airport Long Island, where your guests can stay comfortably. If you’re unfamiliar, the 750-acre Chautauqua Institution is home to seasonal cultural, recreational, and educational programs, as well as the magnificent Athenaeum Hotel. 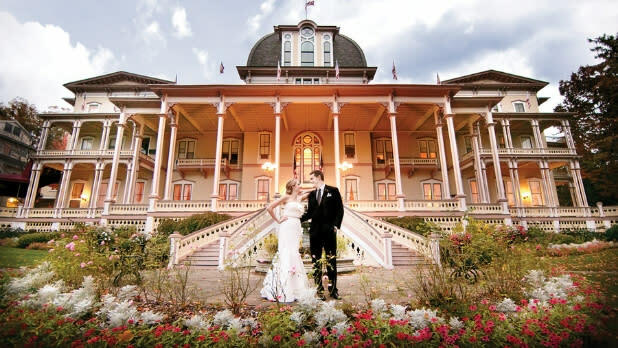 Views of the sparkling Chautauqua Lake and the hotel’s monumental Victorian architecture provide plenty of locations for the ceremony, dinner, and banquet. One popular choice for ceremonies is the Hall of Philosophy, an open-air wedding hall with massive stone-like columns and a timber roof. Move into the grand hotel dining room or ballroom, or even by the bell tower on the lake for your reception. And of course, the Athenaeum Hotel has ample lodging to house all your guests comfortably. 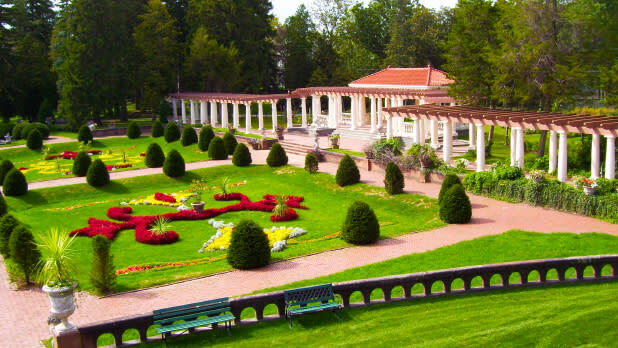 Winner of the WeddingWire Couples&apos; Choice Award for its 5th consecutive year, the Sonnenberg Gardens & Mansion is one of the country’s rare remaining Victorian estates. This 40-room summer home (mansion) from the 1800s is a stunner. In addition to the regal architecture, the property’s highlights include an antique greenhouse complex and nine historic “gardens of the world,” with a rose garden, Italian garden, Japanese garden, and Roman bath. 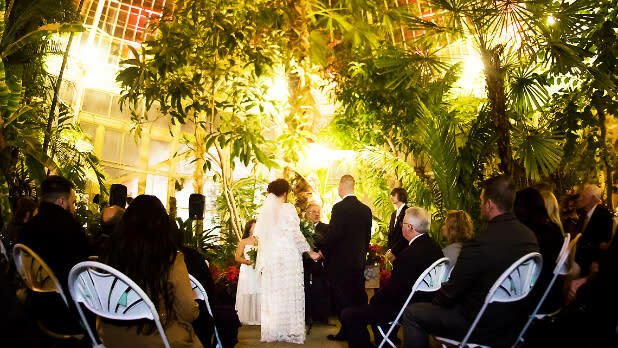 There are a number of gorgeous options for the ceremony and the organizers are happy to walk you through all the gardens for a personalized experience. Hold indoor receptions inside the Carriage house, or larger outdoor events inside a white-framed, open-ended tent next to the castle-esque Aviary building. There are several high-end bed and breakfasts nearby, including the 1840 Inn on the Main and The Inn on the Lake, which will complete renovations in 2020. Rustic meets elegant at the award-winning Timberlodge at Arrowhead. Nestled among the rolling greens and fairways of Arrowhead Golf Club (perfect for father and father-in-law bonding time), Timberlodge offers heated porches, a fire pit, a grand gazebo, and ponds shaded by weeping willows. The main dining area has a high timber post-and-beam ceiling that fills up with natural light during the day and glows by hanging lamp light at night. The menu will have your guests raving and the venue only hosts one wedding at a time, so you’ll receive all the care and attention you need to make your day perfect. 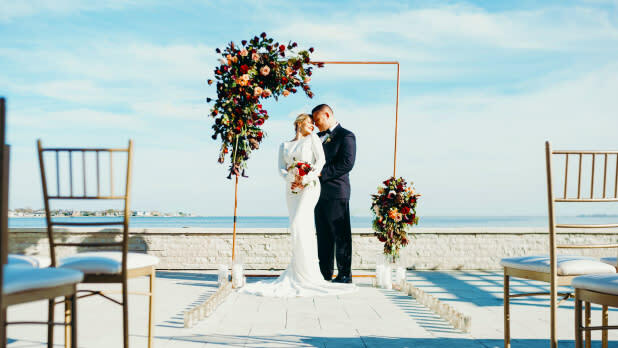 You and your beau or belle will look dashing next to the dazzling St. Lawrence River, where the 1000 Islands Harbor Hotel has everything you need for a dreamy waterfront wedding. Ceremonies can be held outside on the patio overlooking the river or indoors in the ballroom. The hotel provides delectable sit-down catering or buffets for your reception. Guests will love their stay in the hotel’s spacious and elegant rooms, as well as the indoor heated pool and jacuzzi. Plus, there are plenty of nearby activities, such as the Clayton Opera and special tours of Boldt Castle and Singer Castle to keep the gang entertained so you can focus on last-minute planning and, you know, enjoy yourself.